On November 6, and November 30, 2017, I performed in front of Trump Tower, at 725 5th Ave, Manhattan. 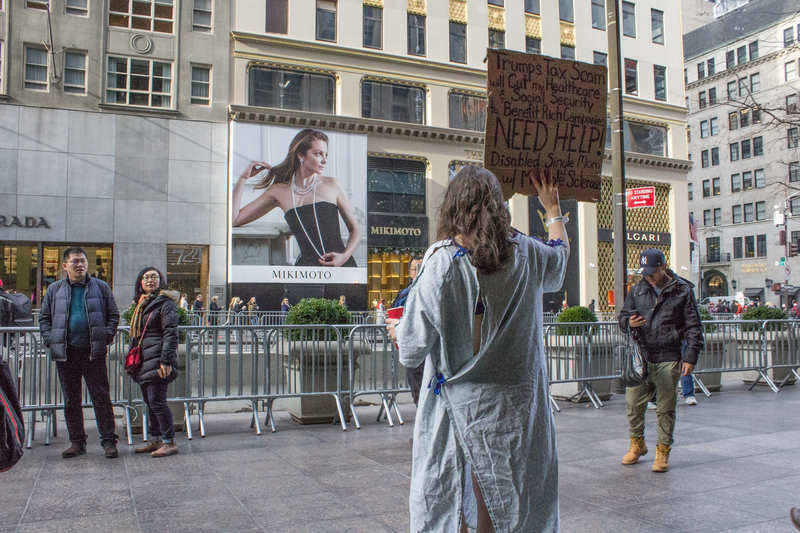 I was a Beggar, in a patient gown, medical ID bracelet, bare feet with a cardboard sign and a cup, begging for help as a political performance protest. On November 16, 2017, Congress passed the 1.5 trillion dollar tax cut to allow for tax breaks to 1% richest people. These tax cuts directly gut Medicare, Medicaid, ObamaCare, pell grants, housing assistance, Social Security, and even cancer research. This plan will destroy my life and millions of others like myself who depend upon Human Services because of our physical and or mental health conditions which limit our jobs. Without the minimal level of healthcare and assistance I currently receive, (as well as millions of others) will become “beggars” panhandling in the streets for basic human rights. Trump Tower, November 30, 2017. Secret Service came twice and I was threatened to be arrested. I want the people to know what these “cuts” will do, who it will effect and the end result. And I figured what better place to do this but in front of Trump Tower, where most people have no idea of what’s happening because it’s not affecting them. So I will disrupt their day and give them food for thought with this performance. These cuts will benefit the wealthiest companies in the world. 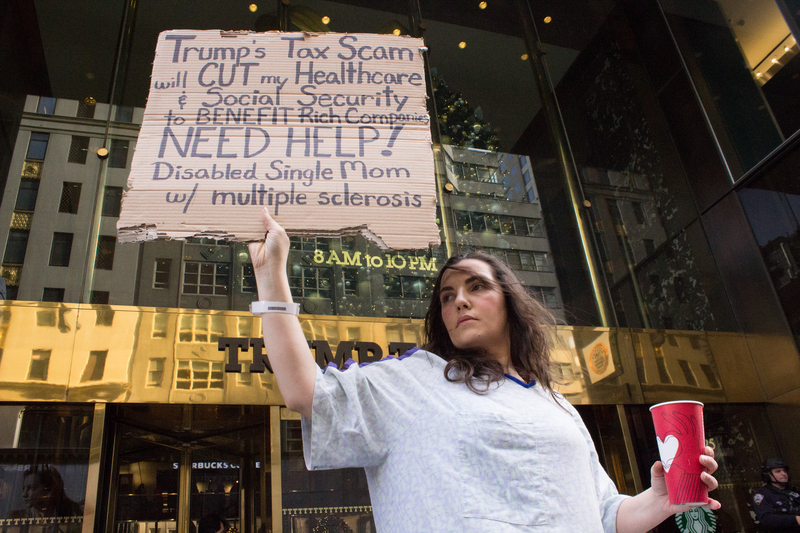 18.7% of the United States are disABLEd and need access to healthcare, without it the affects will be grievous, and people will become sicker and die. The history of the “beggar” for hundreds of years is typically due to people no longer being able to work (due to a health condition) and begging for money, food and shelter. On November 6, 2017, Secret Service came twice and I was threatened to be arrested once. On November 30, 2017, I was threatened to be arrested three times. Beggar on November 30, 2017, was featured at Online Performance Art Festival. Beggar, November 30, 2017, performance photo of my view while performing. The capitalist businesses and advertisements were abundant. This jewelry ad is what women buy into instead of the power of their true self.